How did today’s race pan out for you? I ran seeking a record. I knew the national record can’t be aspired for in Mumbai but matching the course record or trying to dip below that seemed reasonable to attempt. I had trained well for 2019 TMM. But what can I say – till about 33 kilometers everything went well; the pace appeared headed for a 2:13 finish. Then very unexpectedly I felt a catch in my calf muscle. It was bad enough for me to halt and stretch afresh. I resumed the race but the onset of that problem had already impacted my mind. I was worried that if I go fast the injury may aggravate. The remaining part of the race had to be executed in guarded fashion. So at one point, you actually stopped to stretch…. Yes. I stopped and stretched. When I was forced to halt due to the calf muscle problem, I was ahead of the others. It was around the 36 kilometer-mark that Nitendra Singh Rawat who eventually won the race, leveled with me. A difference between the result of this year and last is that in 2018 the gap separating the two of you was thin – three seconds, this time it is a minute and 11 seconds. So, this is what caused it…. Yes. It was heading towards a good timing of around 2:13, when the setback occurred for me. Do you still feel the injury after the race or has it subsided? I still feel it. This is the first time my calf muscle is getting injured. My hamstring has a history of injury and I had recovered from the last hamstring problem I suffered. I also made sure to provide adequate support for the hamstring at 2019 TMM. There was a small pain while running but nothing significant or unbearable. However the calf muscle issue was out of the blue. It is the first time I am getting it; totally unexpected. 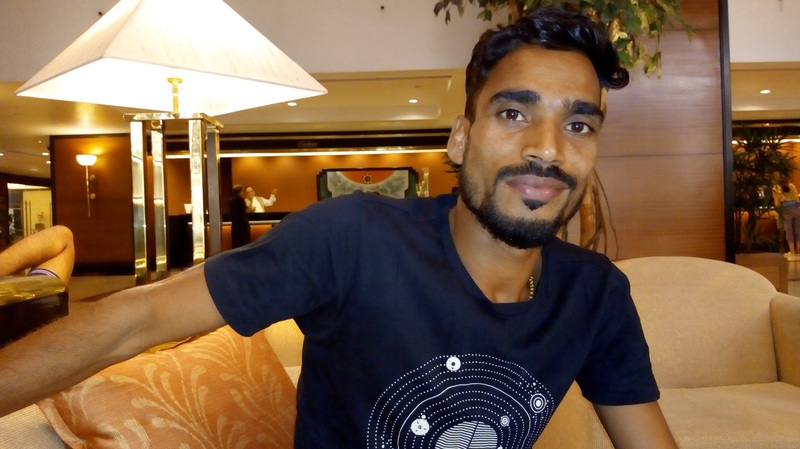 What made 2019 TMM critical for Indian elite athletes who participated is that it was a chance to meet the qualifying time for the upcoming IAAF World Championship in Qatar. You couldn’t make the cut in Mumbai. You still have one race remaining in Delhi to attempt the same…. I had planned to run in Delhi. But then I got sponsorship from Asics. Under this scheme, they have arranged for me to participate in a race in Tokyo on March 3. I won’t be in the elite category as registration for that closed earlier. It is alright if I have to run alone, by myself, not as part of a group with pacers around. I have this chance remaining with me to attempt qualifying for the IAAF World Championship. That is a possibility. But when I looked up the Internet, it appears that is a time capable of rains too. Things will be clearer once I reach Japan. I am optimistic. Yes. However, keep in mind that the qualifying criteria for the world championship are a bit complex at present. Previously, only the qualifying time used to matter for selection to Olympics or world championships. Now it is a bit different – besides timing, you should have run at least three races and your average across these races is considered. Further, your ranking at the global level also matters. It is thus tougher now for all aspirants. That said, if you secure good timing at a race; something that puts you in the top 100 list worldwide, it does improve chances. You now go back to Bengaluru, back to national camp? I go back to Bengaluru. But there is no ongoing national camp for the marathon right now. I train at the Sports Authority of India (SAI) facility. I stay outside in rented accommodation. I now train on my own in the company of fellow athletes. This entry was posted in People, Sports. Bookmark the permalink.